When I first woke up on Saturday morning to the news of the attacks on Paris, my first thought was to write to you- my students. Before writing, however, I needed to wait for some time to pass, so I could work through my emotions- anger, sadness, resolve. I needed time to think about the ramifications these acts of violence have on our societies, but more importantly I needed time to make sense of the cruelty, the madness and the terror we see in our world. I don’t think all the time in the world could have allowed me to make sense of these barbarous acts of murder and violence, but I don’t think that my not-knowing what to say, should stop me from writing you anyway. I think you need an adult voice at times like this to tell you that even as adults sometimes we don’t have the answers either. I do think, however, that these adult voices, maybe mine at this time, should be reassuring in reminding you of value and importance of the work we do everyday as learners. I have been glued to my social media outlets since Saturday morning, reading and following along as so many people pray for peace, or wallow in anger, sadness and pain. This public outcry has forced me to think, “What is my reaction? What am I doing? How will these acts affect me? How will I work for change?” And I can’t help but to think back to the work I do everyday. The work I do with you. I see our school in particular and education in general as a place for activism, and the time we spend together as our best path to change. I see the work that we do everyday in our GCs, in our classrooms and with our classmates and peers as the most crucial of activist work. When people say they #prayforparis, I like to to think that I will #teachforparis instead. It is easy for the us as the privileged and lucky people living far from violence to watch the world from the periphery and mildly react to the fray, but the harder, more difficult work, is to find ways that we can make change in our daily lives through what we think, how we feel, and most importantly by what we do and how we act. When we say Be The Change, we are not simply talking about the class you are taking. When we focus on the Skills and Qualities, it is not for the sake of an ambivalent home-share. We need you. The mission of our school and in the hearts of all your teachers is the desire to pass on the activist spirit. I think I can speak for most of your teachers when I say that over all, we want to teach you the path to peace and justice in everything we do. This is why we got into teaching. Education is the tool we have chosen to change the world. Paris needs you. Beirut needs you. Syria, Iraq, Indonesia….The world needs you. And the work we do to become educated, caring, communicative, collaborative and empathetic people is the only path toward a more just and peaceful world. Anyone can sit around and place blame and simplify complex problems into hate and slogans, but it takes the truly empathetic educated person to find solutions to this ignorance and violence. I chose this work of being an educator, because I love peace. I chose this work because I respect and value young people as agents of change. I chose this work because I want to make the world a better place. I chose this work because I need your help. So please take your work seriously. As you walk the halls on Monday morning, moving from one class to the other, remember that you are not simply waiting in limbo before you can be an adult and join the world. You are not stuck in a boring academic purgatory, waiting to make the world a better place. Remember that you are active participants in society right now. You are the world right now. So how you interact with your friends, teachers and parents is who you are. It is the world we inhabit. You cannot wait to be a member of the world, you were a part of it from the moment you were born. It is times like this that should awaken your activist spirit and remind you to ask questions, be open-minded, be emphatic and most importantly to be an active member of our planet. We need you. I need you to be the change we want to see in the world. See you next week…the work of justice and peace is a long road and there is no time to stop and rest. Yup. There are a lot of quotes about being yourself. You can find more here or listen to this song about it here, but one thing that is annoying about all these quotes is that they are from adults. Adults have a terrible habit of saying things they assume to be simple and clear and easy to do, and then perplexed when teenagers find them to be quite difficult. Let's take being yourself as an example. Yeah, I want to be smart and cool. I want people to like me, but also be in awe of me cuz I'm super book smart, but down to earth. I want to be thought of as a musician although I am not very good, and oh yeah, I want to be thought of as young and cool and hip. And being considered good looking always seems to work for people. But that is all pretty superficial stuff. How about being considered kind, a good dad, teacher and friend? I want to be considered progressive and political, perhaps a bit edgy? What's my point you might ask? Where is my claim? Is there a thesis? I guess my point is: it is hard to be yourself, because people, like most things in life, are always changing. The people who are adaptable and can go with the flow and change and not stick to any established ideas of who they are meant to be, are in essence, the most themselves. It is important to experiment with who you think you are. Even, if you are confident enough not to worry too much what other people think! Yeah, I know that is hard at 14, 24 and 40, but what I am saying is that focusing on yourself is the first step. But remember that even if you can get comfortable in your own skin, it is still important to experiment and not get too comfortable. I like having long hair. I like having a beard. This look is what I expect to see staring back at me from the mirror. It feels like me. It has taken me nearly three years to create this look. My kids are comfortable with it. It gives me the right amount of confidence to perhaps affect a swagger. But is it me? Is it possible that we can build an identity through our appearance? Our hair? Our clothes? Our taste in music? I suppose we are made up of all these things, but what I am arguing is that if these "selves" we are constantly creating become too comfortable, and dare I say stagnate, then are we truly ourselves, or some already out of date model that we are too afraid to change? So this is why I am choosing to shave my head for Hair for Hope. Sure, I want to raise awareness for Cancer and bring some excitement to our school event, but really I need to shake things up a bit in my own mind. I need someone new to stare back at me from the mirror. I need to be reminded that the self I am trying to be is ready for a new chapter, and while the shaving of hair is a simple superficial act, it is one of symbolic significance nonetheless. Try things out. Go with your gut. Make changes even if they feel uncomfortable. You will learn to know yourself through these changes. Take risks. See who sticks by you as you grow. These are your true friends. Don't be enslaved by trends. And when an adult tells you to "be yourself," tell them you are working on it. And so much respect to the thirty other brave kids and adults who are shaving their heads and taking the risk to truly find themselves. 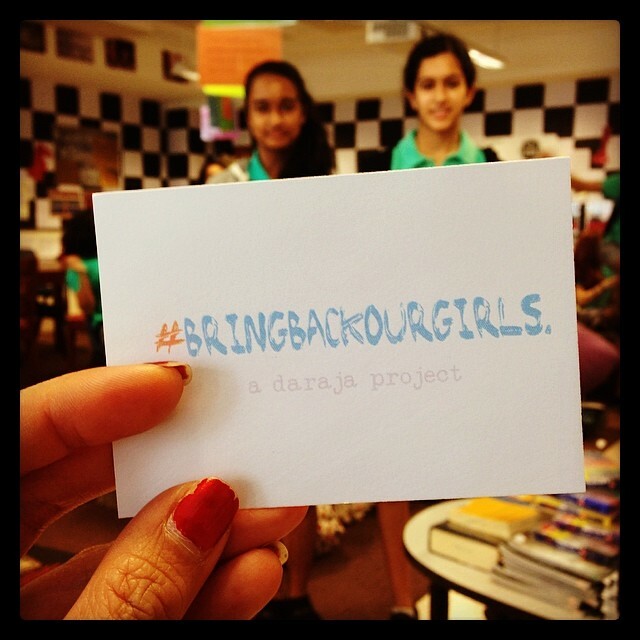 The plan was simple-- Our global concerns group that has been meeting all year to make connections with The Daraja Academy and raise awareness at our school about gender equality and girl's rights was going to kidnap all the grade 7 and 8 girls! We wanted to raise awareness about the 200 girls who were abducted in Nigeria and shed some light on the #bringourgirlsback campaign. We also wanted to remind all the teachers and students in our school just how valuable our girls are! First step was that we didn't tell anybody. We felt that the demonstration would be more convincing and effective if no one knew what was going. We wanted to catch everyone off guard. The girls were a bit nervous about not asking the teachers, as was I if I am to be perfectly honest, but we took a risk. There were a few teachers who were confused, frustated and annoyed, but for the most part most played along. After reflecting on this event, I did realize that perhaps this was not the right precedent to set. There are so many passionate people at UWCSEA and so many amazing projects, that if every group pulled surprise stunts like this every week, our school would fall into ineffective chaos. I am glad, however, that we were able to do it this time. Our intention behind the secrecy and the slight element of danger, was that I wanted the girls, both participants and organizers to realize that sometimes political activism involves taking risks and being unsure of the final outcome. Sometimes to truly empower yourself, you need to demand a bit of power. And if you are not willing to sacrifice something, then perhaps you are not truly committed to your cause. At 8:15am eleven girls from our GC, went to every mentor group, eighteen total and asked if they could quickly talk to the girls in the class. That's roughly 180 girls! Once they were out of the classroom, they directed them all down to the tent plaza. I was so impressed both with the organizers and the participants for acting so maturely. Before going down, they were told about the events in Nigeria and the work our GC does for girl's rights in Africa and at our own school. And cards in the place of the missing girls that said, "We have been kidnapped. Find us in the plaza." While the boys and the teachers were trying to figure out what was going on, the girls made their way to the plaza. Once all the girls were downstairs and the boys and teachers came down, I read a message over the school PA system, stating that these girls had been kidnapped and would be sold into marriage at $12 a piece. At which time the girls, who were holding signs that said, "How Much Are We Worth?" Began a call and response chant. With all 180 girls present. All in all, it was a beautifully planned and well executed demonstration. I am so proud of all the people involved. The organizers, the participants both boys and girls, and yes the grumpy teachers. After the demo, we sent the following email to all the students in the middle school. so our intention would be clear. You will probably, be wondering why all the girls in your class randomly left during mentor time. This is because we, the Daraja GC have a mission to raise awareness about what happened in Nigeria, where nearly 300 girls were abducted from their boarding school at night by an Islamic militant group who believe western education is a sin. The coverage for this news has been hidden due to other major stories such as the South Korean Ferry accident and MH370’s disappearance. It is has come to our notice that not many people in our school are aware of our GC and this incident and so we decided to create a simulation to show the thoughts of the people at the time. Our GC, Daraja promotes gender equality and try to spread awareness of the discrimination based on gender specifically in Africa. As you know this incident took place in Nigeria and we came to realize that if this same incident took place in Europe or other such places it would be the biggest headline but due to this taking place in Nigeria it has been ignored to an extent. We would like to take this opportunity to educated you on gender equality and incidents taking place around the world which a lot of people are unaware of. Our GC aimed to make the girls whom we “kidnapped” to be unaware to show them how when such incidents happen, they can be rather sudden and shocking but also at the same time we wanted to capture the students thoughts on the girls disappearing suddenly through this simulation. Our GC wanted to see what the reaction of the student body was and compare with the reaction to this real life incident. The group which kidnapped these girls claims to sell them for $12 which we found to be interesting and so we decided to ask what the girls are worth which leads us to the chants we did. We decided to answer the question for the girls in our school and show the student body what we believe girls are worth. Our GC also welcomes you to join next year if you are interested in our work against gender inequality. For more information on our GC, contact Mr. Raisdana. So now, we would love to hear from you. What did you think? How did you feel? What will you take away? Was it worth it? Was it effective? Why? How? Whether you were an organizer, a participant, a boy or a girl, please share your thoughts in the comments below. Or if you prefer to share your thoughts more privately, send me an email. What?! My last post was on the 25th of February? How did that happen? I was supposed to be a good role model and try to write at least once a week. I see what you all mean-- life can get busy and writing becomes difficult. But I am going to choose to carve out the next 20-30 minutes and crank out a post. Here we go. Hang on. You are my inspiration. Reading through my feedly, I am so impressed by the quantity and quality of the posts some of you have been writing. (I may not comment, but I am reading every post.) Despite all your busy lives, some of you have chosen to flex your writing muscles, open up your hearts, take a big risk and blog! Reading your posts reminds me that we all want to be heard and understood and listened to. I am still convinced that having a space to write and share our ideas, thoughts and feelings is a great way to work our out issues, while also connecting to others. These connections help us understand that we are not alone and many people go through the same things we do. It may appear that you have little to say or that no one will care, but people do. You matter and so does what you have to say. So anyway.....I have decided to round up a few blogs as examples of what it looks like when you are write consistently and build up your stamina. The following people are bloggers because they choose to make time in their days to hone their craft and attempt to reach an audience they are not sure exists. This reaching out takes guts and practice so Good On Ya! Not a bad list, but where are the grade 8s? While we haven't spent as much time promoting the blogs in grade eight, there are few die hard writers out there who are writing with some consistency. Come on grade 8s! Let's see some more writing on your blogs. If you are interested in writing, sharing, blogging and audience than come join the power bloggers. Take the first step and just start writing. If you are stuck and need some ideas take a look at and subscribe to some of the blogs from above. They are sure to inspire you, as they inspire me. Hey. Me again. Man! Am I busy and feeling stressed. I seem to have too many things in the oven so to speak, and I am not sure if everything will cook correctly. I have, what feels like, a million things to do these days and not even sure where to even start. In addition to planning and running the intensely interesting and life changing lessons I teach you everyday, I am planning a two-day fifteen hour workshop for teachers in April. I agreed to write my first paid piece for these guys (also by April), and I am trying to read more young adult books. I just finished Monster and started Divergent. I feel I am behind in conferencing with both grade seven and eight and worried that you are not receiving timely and useful feedback. I want to create an automated feedback form, but can't seem to get around to doing it. We are also starting to think about and plan the next units for both grade seven and eight on Shakespeare, while we also documenting the things that worked and didn't quite hit the mark with our current unit in the unit planner. Oh and when I get home I have two kids to raise, a wife to hang out with and my own thoughts to wrestle with. My point. Life can be busy. It can be stressful. I feel your pain. This post is not about comparing who is busier or throwing ourselves a pity party. I wanted to share some strategies I use when I am feeling overwhelmed. First thing you might be asking is, "Mr. R, if you are so busy why are you blogging? Why don't you just start that feedback form or keep working on your upcoming workshop?" Well, you might find this hard to believe, but writing actually relieves my stress. When I sit at the screen and hear the sounds of the keys, clickty clack and I watch my thoughts take form on the screen, I feel a sense of calmness descend on whatever freak-stress-show I might be involved in. Writing helps me stay sane. Tonight, I will come back to school, walk down to the music studios and play music for two hours. No matter how busy I am, I know that I need this time to re-charge. 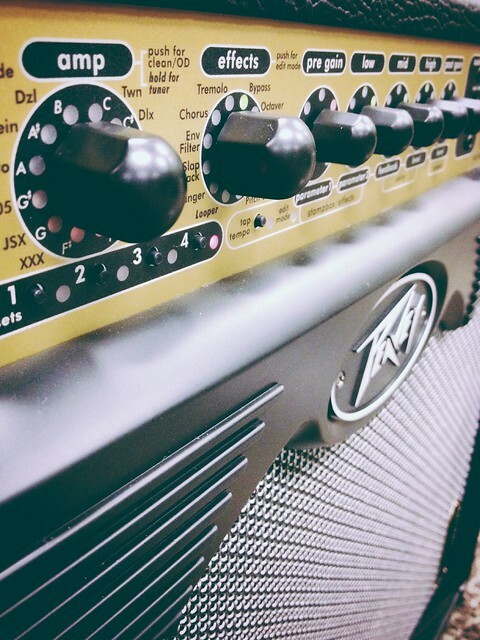 I crank up the amps and I sing. I play. I sweat. No matter how tired I am it helps me re-group and continue on the rest of the week. Music helps me relax and I enjoy watching myself learn and grow as a singer. I asked my Facebook friends to send me their home addresses, so I can make the first three who sent me their addresses a hand-made piece of art. I like to always have an art project on the go to keep my mind creative. I have begun to buy the supplies for these pieces, but it is the thinking about them that helps me find balance. Making art brings balance to my life. Okay, wow. I'm going on and on. You are busy too. I know. I get it. I feel you. But as you can see, how you manage your stress is up to you. It may appear that I am just giving myself more work, and in a way I am, but it is work I care about and love. So to help alleviate stress you must make room to do the things you love. What kinds of things do you to relieve stress? What helps you find you balance and stay sane. Share your ideas in the comments below! I'm sitting in the main hall last Thursday, still a bit groggy and not really awake yet. You are there too. A few rock bands have played and I feel an indescribable sense of pride. The same pride I feel every time I see young people expressing there passion, however, self-consciously. Makes me think that passion when given a voice, no matter how awkwardly, is why I do what I do. The MCs crack a few more terrible jokes to a smattering of chuckles from the front of the hall. I notice the stoic eighth graders expressionless, always too cool for school, whisper to each other-- clearly annoyed to be lumped together with the rest of these "children." I think back to when I was your age and wonder if I am doing good work. If I'm making a difference, getting through to any of you. Teaching you anything at all. Then a Balinese man is on stage placing a microphone near his phone. A shrill painful Gamelan begins to squeak from the PA speakers. We all wince in pain and I look around the room to see how everyone else is reacting. A group of young men take the stage and begin to dance like Birds of Paradise. I am bored and quickly forming judgments: the music is too loud and needs more bass. I don't like this type of dancing. I don't want to be here. I scan the room and to my horror I see the same expression on your faces. Is my boredom as obvious as yours? Am I that bad of a role model? Education is not about opinions. It is not about liking or disliking. Education is not about always having fun and being engaged. True education is about exposure to a diverse range of expereinces. The truly educated person is not concerned about always liking what they are exposed to, or worried about it always being fun or pleasurable. The truly educated person is simply open to experience for its own sake. As an adult, I realized that while I was not enjoying the Balinese dance, I could recognize that having witnessed it, it added to my overall life experience. It was teaching me. I was learning. This realization and reminder that everything in life is teaching me and that I am always learning, excited me beyond belief. I begin to wish that you were having similar thoughts. I wanted to stand up and grab the microphone and remind you to appreciate the incredible amount of expereinces you are being exposed to everyday at school and everywhere else you roam. I wanted to tell you to sit up and not mope. Forget your opinions and your likes and dislikes and just soak in the moments. Every single one of them. There are people in this world who will never even know there is a place called Bali. Never mind watching dancers from the island. I wanted to remind you that you are lucky, not in the annoying way know-it-all teachers have a tendency to do, but as a mentor, a father, a friend who has been a round a bit longer than you. A man who has learned a few things in his life and has devoted his life to teaching them to you. I didn't have the microphone last Thursday, but I do have it now, so what were you thinking last Thursday? What are you thinking about now? It's hard to teach people who do not interact with your thoughts. Leave a comment. Share your thoughts with me on any thing I said in this post.